The New College Curriculum Requirements | General Education, U.Va. Most Engagement courses meet for 7 weeks. Students are advised to enroll in only one of these courses at a given time – thus, a typical student would enroll in two consecutive 7-week Engagements in each semester. Other Engagement courses meet for 14 weeks. These 2-credit Engagement courses are paired with another Engagement course (co-requisites) and must be taken together. These courses are taught by the same Engagement Faculty and share an Engagement theme. By enrolling in these two co-requisite courses, students can explore one subject from the lens of two Engagements simultaneously. Students in The New College Curriculum should not enroll in more than 4 Engagement credits in a given semester. In practice, this means students will enroll in two Engagement courses in the Fall and two Engagement courses in the Spring. After placement, complete the remaining courses in the sequence up to the fourth semester (usually 2020). Placement in a language sequence is by SAT II Subject Test score, Advanced Placement (AP) Exam, Higher-level International Baccalaureate Exam, or a departmental placement test. Consult the Foreign Language Placement Index (http://college.artsandsciences.virginia.edu/fl-placement-index) for specific departmental standards. Students must follow the department’s recommendations in the completion of the foreign language requirement. Once placement occurs, the foreign language requirement is fulfilled by the completion of each course in sequence. Credit for introductory language courses is disallowed if it duplicates foreign language credits offered for admission to the College. The Rhetoric for the 21st Century literacy component provides experience with rhetorical arts learned and practiced over the course of one’s life. These include written, oral, and digital forms of expression used by highly literate members of society. Both the First Writing and Second Writing requirements comprise the Rhetoric for the 21st Century component of the new curriculum. All undergraduate students meet the First Writing requirement by successfully completing one of the requirement-eligible ENWR courses as determined by placement. For information on placement, go to the English Department's website. 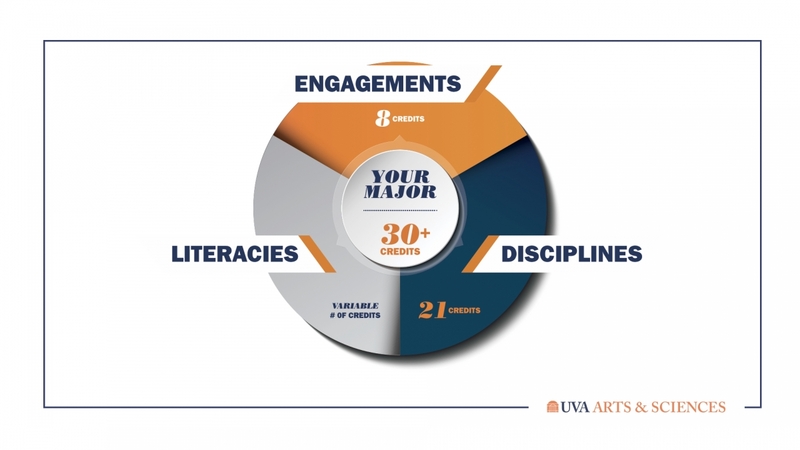 All undergraduate students must complete at UVA the Second Writing requirement by enrolling in an identified Second Writing course with a grade of C- or better. Courses that meet the Second Writing Requirement are coded as such in SIS. Students may also petition to have a course fulfill the second writing requirement by filing a Second Writing Requirement Completion Form and have it certified by the College Registrar (138 Monroe Hall). Courses that fulfill the Second Writing Requirement may also count for courses that fulfill either the Disciplines or Quantification, Computation, & Data Analysis component. The Quantification, Computation, and Data Analysis global literacy enables students to apply mathematical skills to understand and solve real world problems. Through this requirement students will develop quantitative literacy through both theory and application. Students fulfill this requirement by completing two 3- or 4-credit courses coded in SIS to meet this requirement. The Disciplines ask students in the New College Curriculum to explore the varied ways our faculty approach knowledge, learning, and discovery. Students in the New College Curriculum must earn 3 credits in each of the seven Discipline categories. Courses that count towards the Disciplines must be taken from six different departments. Courses taken to fulfill major requirements may count towards the Disciplines. While courses may be cross-listed in multiple Discipline categories, courses may only count towards fulfilling one category for each student (example: While HIEU 3321 Scientific Revolution is cross-listed in both “Science & Society” and “Historical Perspectives,” a student must individually choose which category she/he desires it to fulfill. Transfer credit earned before matriculation may be applied toward fulfillment of The New College Curriculum where the credit earned is equivalent to any UVA course that presently fulfills the above requirements. All courses that count towards The New College Curriculum must be taken for credit and for a grade. Courses that fulfill a Disciplines category may also satisfy the Second Rhetoric for the 21st Century Requirement where applicable. To help students keep track of their progress towards completing The New College Curriculum, the College offers a New College Curriculum Checklist.